4-Week Bills Yield Same As 3-Month Bills With March Rate Hike Now "Priced Out"
Something notable took place during today's auction of $40 billion in 4-Week Treasury bills: the yield at which they sold, which came at 2.365%, was the same yield as the 3-Month Bills issued just three days ago, on Monday, Dec 3, confirming that the market is starting to price out an expectation for a hike during the March meeting. In addition to today's sale of 4-Week Bills, the Treasury also sold 8-Week bills at a yield of 2.39%, as yields pushed higher across the front-end of the curve. According to Jefferies economist Thomas Simons, Four-week yields are rising "as we get close to the December meeting," while "the March Fed meeting is being priced out of Treasury-bill yields." "The majority of the life of both of these bills will be in between the December meeting and the March meeting so the rates should be the same." 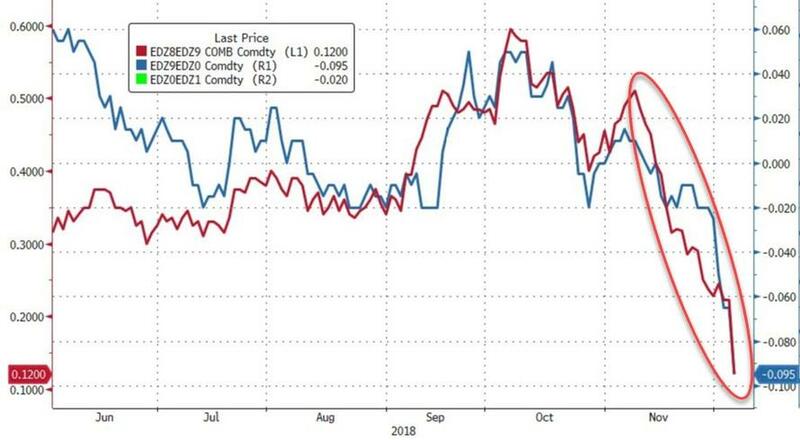 As we showed earlier, as a result of today's market rout, traders are now pricing in just 12 bps, or less than one full rate hike, in 2019, and roughly 10 basis point of rate cuts in 2020, when the Fed is expected to resume easing as the economy is widely expected to have entered a recession by then. 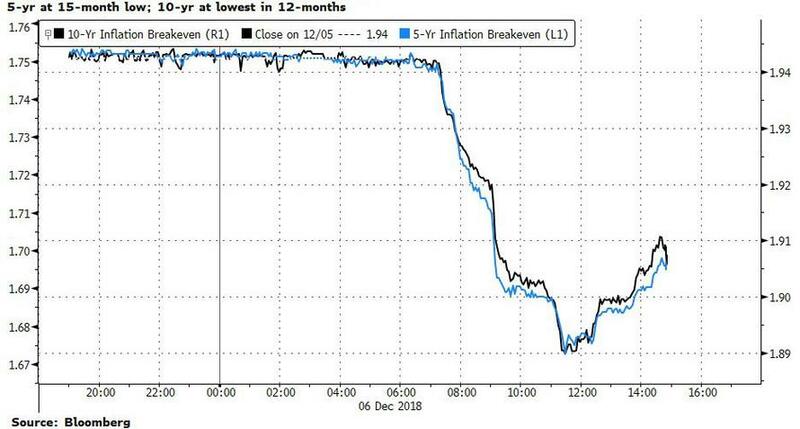 ... the Fed may be cornered as any hopes of inflating away the debt are fading with inflation expectations once again getting "unanchored" this time to the downside, leaving Powell with just one option: to once again start monetizing the deficit, i.e. prepare for QE4 some time in late 2019 or early 2020.